We have 4 registers in our store. Today, 2 of them began printing Receipt #'s (the last 6 digits of order.source_identifier in JSON data) instead of the Order # (order.name in the JSON data) at the top and bottom of the receipt. The other 2 registers still print the order # as it has been for the last year. These types of changes are incredibly frustrating for us as the order # was incredibly helpful to us in identifying orders in the back end. Can anyone provide clarification as to how to get it back to showing the order.name? Hi Brandon SPX! I'm sorry that you had to deal with that. I would like to follow up with you to see if all of your printers are now displaying receipt numbers. If you have a couple minutes to spare, please email me at: erin.chan@shopify.com. It's worth noting here that the new receipt numbers are searchable in the admin on both web and mobile, as well as in the POS app itself. This change was made to improve the performance of POS checkouts. Yes, finding orders in the backend works perfectly fine using the receipt ID. Unfortunately, we have an integration which specifically utilizes the order number (order.name). We run a museum and each admission comes with a $2 discount code towards product at the end of the tour. We use an order webhook to create the admission discount code and the order.name is the discount code to ensure it is unique. 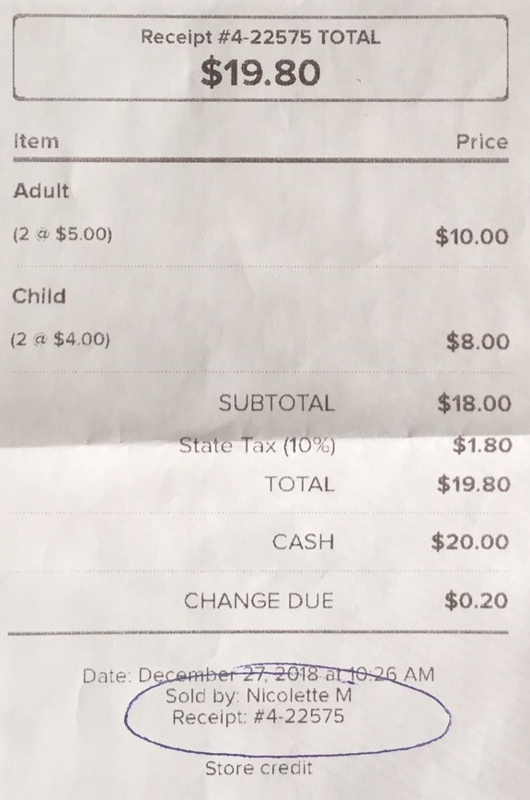 The visitor simply shows their receipt and we plug the order.name into the discount code field and it all works beautifully. Shopify iOS (and presumably Android) application update messages tend to include very few details about changes made. Sometimes they include no details. This would be fine if there was some other mechanism for alerting shops to upcoming changes. Receipt customization really should be a priority for Shopify. I understand there were a number of customers bucking for the receipt ID to be used instead of the order number, but the most graceful approach would have been a way to choose what is shown. I'm not trying to create a major stink about this, but I hope I'm at least getting the point across that even seemingly minor changes can create issues for your customers. In one of our busiest weeks of the year we had no idea what was happening when our registers began what was essentially an update that broke our discount flow. This has also caused a major issue for us as well. For the past 3 years we have used Shopify POS the order number was the same as the receipt number. Suddenly it changed right during the busiest holiday of the year so that they no longer match. We sync our sales to Quickbooks Online and when the receipt number does not match, it takes twice as long to reconcile the deposits everyday. Now I have to have my store manager write the actual order number on every receipt before she turns in her daily deposit worksheet. Makes double work for everyone. And as you mentioned, Shopify did not let us know they were even doing this change.